1) The single line of straight stitch called for on either side of the braided cable seemed flabby, so I knit/purled through the back loop of those stitches throughout to twist it and tighten up the stitch. 2) The pattern called for 15 rows of K2, P1 ribbing to finish the top edge of the collar; I knit only 13 (and might even have preferred fewer than that). 3) As far as gauge is concerned, I was "close" with the US 8 bamboos. In the end, the pieces were blocked in the manner directed in the book -- pinned to measurements given and covered with a damp cloth (in this case, a fairly substantial towel, fresh from the "max extract" washing machine cycle), and left 'til the cloth was dry (approximately 24 hours). When the blocking cloth was dry, it was removed and the pieces unpinned; they hardly budged. The pieces reached the specified measurements without any difficulty (plenty of give) and, as knit, they could have been blocked slightly larger or even a little smaller. 4) I have not yet attached any fringe; I may do that in the future; it will definitely cut into a 10th hank of yarn. I love looking like an idiot for you people this sweater. It was a joy to knit and put together. It's comfortable to wear and it's pretty much turned out just as I'd hoped. There is plenty of ease without looking huge; it's substantial, but not too heavy or warm. I started with the sleeves, then knit the back (these pieces were finished before Christmas), and finally the front and collar pieces (since Christmas). Originally, I was going to do one less repeat on the body than the pattern called for, but I changed my mind on that and I'm so glad I did. During the next blocking, I will try to lengthen the sleeves just a bit -- they could be a tad longer for me. I've created a St. Brigid photo album with some WIP photos and eventually I'll post these thoughts, and any others that might come to mind, over there. It's so beautiful. Congratulations! I like it so much sans fringe. Don't fringe it! I think it looks absolutely wonderful.The color looks great on you. You should be very proud of yourself! The sweater looks fantastic on you...I vote no fringe too. It looks like a great fit as well. Your work is just gorgeous.(clap,clap,clap). St. Brigid looks like the perfect sweater for you, Vicki. Kudos on color choice and fit! Fabulous, fabulous job! It looks so great on you Vicki! Congratulations. Absolutely and positively the prettiest thing I've seen in a long while. I hope you're proud of your work. I think its great without the fringe. Hoping no one curses me for it, I'll wish for a little more winter to keep you wearing St B's cabley goodness for another month at least. I'm so impressed! What a beautiful sweater and it looks so nice on you! I love the color of 220 you chose, too. Congrats on creating such a beautiful sweater! Well done, it looks absolutely amazing, you must be so thrilled with the finished results, its perfect for you. It really does look wonderful and very much needed in all that snow too. You don't need to do a Rachael, your expression says it all! It sweats really well on you. Bravo! It really is a work of art! The color is perfect and the sweater looks great on you! What more could a knitter ask for?? I'm going to keep gazing at the pictures. They are THAT great! Oh, St. Brigid is just gorgeous!! I'm also glad that you mentioned Cromarty again, because I remember you starting it but couldn't remember seeing the finished sweater. I have to ask. . . what is it about Cromarty (or St. Brigid) that made you finish St. Brigid first? In the best of all possible worlds, I will eventually knit both of them, so go ahead and be painfully honest. Oh my gosh, it's finished! It looks fabulous and what a great color on you. Wow. I am so impressed. I didn't know you were making the larger size. 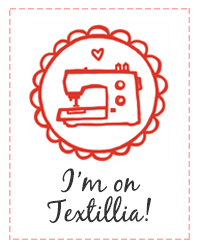 Now I'm nervous because I'm making the smaller size. And from the photos, it seems like we might be close in size. yikes! At least I know I should have enough yarn. "Simply the best! Better than all the rest..." (I'm singing that Tina Turner song for some unknown reason). It's so beautiful... you did a great job! ... and you even have some more Winter to wear it in... it will make the rest of Winter a little brighter. congrats! it is amazingly beautiful--wear it proudly! I haven't yet caught the Aran-bug, but this sweater makes me want to stock up on wool and cable myself until next winter. very nicely done--it looks beautiful! gorgeous sweater! cool pics. just amazing! So stunning. It looks fantastic! Love the photo shoot Vicki and of course the star is the sweater ;) Great color for you and the fit is wonderful ...be proud! Funny I noticed that no matter how hard Carrie and I tried we always looked a certain way in our knitting photo shoots when we did each other. I think it has to do with the familiar aspect. If I would get a friend to take my picture I would look totally different. You are just lovely and shouldn't be shy about pictures being taken. What a great sweater! It looks marvelous and like you could wear it everyday. You really did a super job and now have something worth all the time and effort. It's beautiful!! Savannahchick was right to send us here...it is a fantastic sweater. Wow, I can't believe that is your first Aran - I guess that means you will be making more! Great job, and Happy Knitting! Wow! what an excellent job...I can't believe that is cascade! ooh you gave me shivers with the "mom" look! I used to get that sooooo much it still stops me in my tracks! I think you look FABULOUS, in both poses. And that sweater! What a triumph! Wear it with pride, dear! Delightful. St. Brigid is so beautiful that I want to make one for me. This is quite saying something since I haven't made a sweater in a really long time. But I've been watching your progress for a while now and the end result is a true inspiration. Amazing! Beautiful! Way nicer than the one in the book! Thanks for inspiring me to finally get started on mine. that looks wonderful on you!!! stunning,and I love the colour on you.awesome job ! Wow, it's beautiful. The color is striking and the cables are gorgeous. Brava! That is really stunning. Good work! I am from South America, and I would very happy if you or other person could send me a graphic to knitt this St. Brigid pattern. 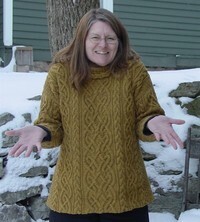 Thanks in advance if you could help me with the pattern for this celtic beautiful sweater. 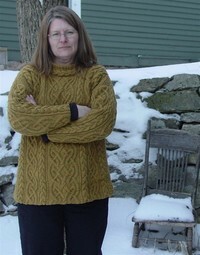 Faby again, I forgot to wrote my email if somebody could explain me with a graphic pattern for the St. Brigid sweater. Thanks in advance and kisses! !